Aweber is the service that I use to send The Ask Leo! Newsletter. I’ve used them for years, and they are highly respected in the industry. I honestly can’t think of a better company to work with. One of the things that Aweber supports, as do other email sending services, is the ability to tell which links people click on. “clicks.aweber.com” is the internet domain that they use to perform this function. How do they do that and why do I let them? When I put a link to something in my newsletter, say a link to http://buyleoalatte.com, that link is replaced by Aweber with a link of their own that begins with http://clicks.aweber.com/ followed by information that tells them exactly which link it was that was clicked, and who clicked it. When someone clicks on that link, it’s http://clicks.aweber.com that gets requested. That server records the information about the click, and then automatically and transparently redirects the user to its actual destination – http://buyleoalatte.com in my example case. You click on a link and get to where you’re supposed to go, clicks.aweber.com simply acts as an intermediary to record the fact that the link was clicked. By understanding which links get the most clicks, I can tell which articles – and perhaps more importantly which types of articles – people are most interested in. It’s one data point that basically tells me to “do more of that”. By noting who is clicking on links I know who’s actually interested in the newsletter, and who’s getting it but never bothering to look at it. More on that below. It’s important to realize that almost any newsletter you sign up for anywhere, any time – be it a newsletter from your favorite tech web site, your utility company, or breaking news site – can and probably does something similar, and for much the same reason. It’s a way we as newsletter publishers have of seeing where we’re succeeding and where we could do better. Isn’t this some kind of privacy thing? It’s important to realize something that I’ve said over and over again… as an individual your activities just aren’t that interesting. Sorry. I don’t think anyone has any particular interest in looking at what you, specifically, are or are not clicking on. Even if I did have some kind of bizarre curiosity at an individual level with tens of thousands of subscribers I just don’t have the time to do it. On the other hand, the trends shown by rolling up all that data on tens of thousands of individuals is very interesting. This is the data that tells me things like only a handful of people bothered with this article, but almost everyone looked at that one. I’m not looking at you as an individual, but the aggregate data is exceptionally helpful and valuable to me. What’s that about whether or not I’m interested? As I’ve also said repeatedly, there’s no 100% reliable way to determine if an email has been opened. If I include an image in the newsletter (as I do – my logo for one, my signature at the bottom for another), the act of fetching that image to be displayed tells Aweber that you opened the newsletter. 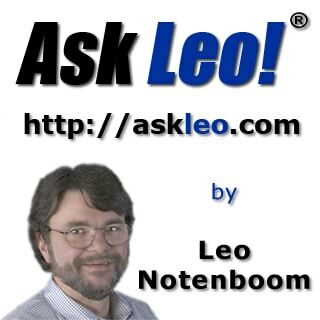 “Ask Leo! – Be sure to allow image display for the best viewing” where the logo should be) then that technique doesn’t work. However if you click a link that also tells Aweber that you must have opened the newsletter to even see the link. That’s called an “inferred open”. Why do I care so much about opens? If you’re getting the newsletter but never opening it, that tells me you’re not interested. If too many people do that I need to know that what I’m doing isn’t what they want. What’s worse, though, is that the major email service providers also see which emails you open and don’t. If they see that a lot of people subscribed to my newsletter never open it then that affects my “reputation” and my deliverability with that service. Put another way, if enough people never open the newsletter it gets sent to spam more often. That’s why every spring or so I actually unsubscribe those people that haven’t opened the newsletter in “a long time”. Since they never opened it, they weren’t interested, and they never even notice that they’d been unsubscribed. Occasionally it appears that some security software, ad blocker or perhaps even malware causes clicks.aweber.com to be blocked, which means that when you click on one of my links that uses it you get some kind of “sorry, you can’t get there from here” message. Thanks to a reader, I’ve confirmed that the MVPS host file replacement is one example, as it does indeed block clicks.aweber.com. Let me be clear: I believe, strongly, that this is an erroneous and unwarranted block. clicks.aweber.com is safe. That being said, I’m not going to argue the point. If you like you can simply remove any aweber.com domains from the hosts file and you should be just fine. If you elect to leave it in place, then you won’t be able to click on some or perhaps all of the links in my newsletter, and the newsletters of other aweber customers. In my case you can simply read the latest newsletter on the web.